Today was a very hot and humid September afternoon so I decided to take myself and my son on a Mom/Son date to the newly opened Steak n Shake in our hometown near the mall! We were greeted and shown to our booth by one of the staff then given menus to decide what to eat!! It is a very nostalgatic burger and shake resturant by the decor and decided to freshen up in the rest!! Due to being a special needs family, we were greeted and treated in very gracious manner and no one made a "BIG Deal" about using the women's restroom handicap stall since my nonverbal son can't use the men restroom by himself! After using the restrooms, Nathan and I decided on the various milkshake items to go with the Birthdaycake Shake and small fry! Within few minutes, the waitress brought our shakes and fries to the table!! 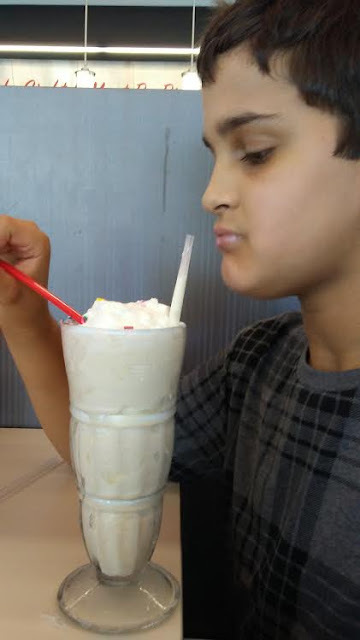 My son and I enjoyed the taste of the 80th Birthday Shake which is shake topped with whipped cream, sprinkles, and a cherry!! Nathan enjoyed eating the thin cut fries and eat them all up! When its time to go, the manager was gracious in providing a To Go cup so Nathan can finished his milkshake for later!! 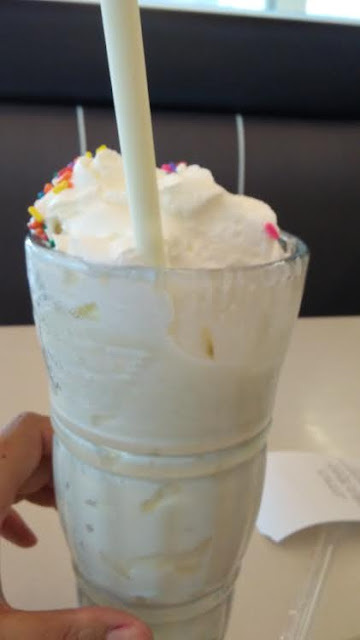 We can't wait to go back here for the tasty shakes and great service!